Materials can be described as being on a spectrum from a perfectly ordered crystal to a perfectly disordered anticrystal. Physicists show that the anticrystal, a theoretical solid that is completely disordered, should undergird our understanding of most materials. For the last century, the concept of crystals has been a mainstay of solid-state physics. Crystals are paragons of order; crystalline materials are defined by the repeating patterns their constituent atoms and molecules make. 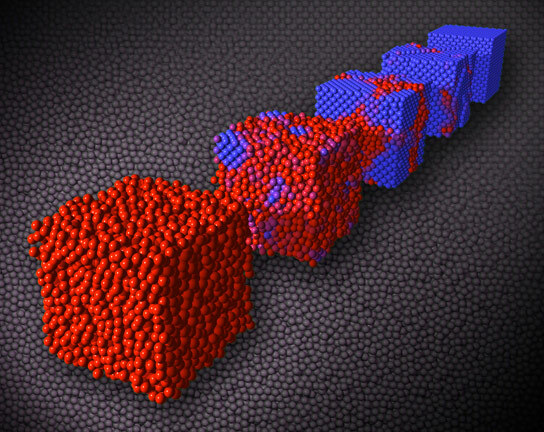 Now physicists at the University of Pennsylvania and the University of Chicago have evidence that a new concept should undergird our understanding of most materials: the anticrystal, a theoretical solid that is completely disordered. Their work suggests that, when trying to understand a real material’s mechanical properties, scientists would be better served in many cases by starting with the framework of the anticrystal and adding order, rather than starting with a perfect crystal and adding disorder. That is because the mechanical properties of even a slightly disordered solid can have more in common with an anticrystal than a perfect crystal. Understanding these properties is critical for modeling how materials will respond to stress, as well as for designing new materials and predicting their behavior. The study, published in Nature Physics, was conducted by Andrea Liu, a professor of physics in Penn’s School of Arts & Sciences; Carl Goodrich, a graduate student in her group; and Sidney Nagel, a professor of physics at the University of Chicago. Outside of extremely controlled conditions, no real crystal is perfect; there are always places of disorder within the overall pattern, which are known as defects. However, when describing the behavior of a crystalline material, scientists begin by treating it as if it were a perfect crystal, then extrapolating from that point based on how prevalent its defects actually are. Knowing the exact shape and location of each defect isn’t necessary. “But if you keep adding disorder, the extrapolation from the perfect crystal fails badly. The mechanical properties can no longer be described well from the perfect crystal. That’s where the anticrystal comes in,” Goodrich said. Non-crystalline, or amorphous, materials may have regions within them that have atoms in different repeating patterns but no overarching order. This means that the properties of glass or plastic cannot be inferred from a perfect crystal, but. working from the other end of the spectrum, a perfectly disordered solid, had not been feasible. Not all disorder is alike; a deck of cards, for example, has one “correct” order but can be shuffled into an astronomically large number of different sequences. “In the last decade or so,” Liu said, “many researchers have shown that all of those different ways of being totally disordered do have something important in common, like how likely you are to draw a certain hand even given all of the ways you can shuffle a deck of cards. A phase transition is what happens when one state of matter turns into another, such as when water freezes. A decrease in temperature means that the hydrogen and oxygen atoms of the water no longer have enough energy to bounce out of the six-sided pattern they naturally nestle into. Without being able to move and flow past each other, the hydrogen and oxygen atoms crystallize into solid ice. Another way of producing a solid, however, is by jamming particles (such as atoms, molecules, or even grains of sand) together, physically constraining their movements under high pressure. “Anytime you have a critical point like a phase transition, studying the details really close to that transition tells you about how systems further away from the transition behave,” Goodrich said. By extrapolating away from the jamming transition, the researchers showed that even fairly orderly materials exhibited behaviors closer to those of the anticrystal than a perfect crystal. Having a better starting point for glass or plastic would be a boon to both research and industrial design, but the principles of the anticrystal are powerful because they can provide insight into many crystalline materials as well. Making alloys like steel stronger often involves making their crystalline patterns smaller and smaller, meaning their behaviors are better and better described by the anticrystal. The research was supported by the U.S. Department of Energy and the National Science Foundation. Be the first to comment on "Solid-State Physicists Consider the ‘Anticrystal’"